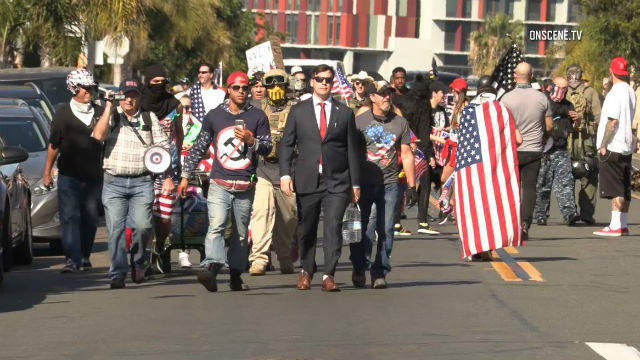 A man reacted violently and punched a San Diego police officer in the face after the officer and his partner ordered him to stop walking in the middle of the street near a rally in Chicano Park, a prosecutor said Wednesday, but a defense attorney said his client did what he had to do to defend himself against officers he didn’t trust. Frederick Jefferson, 39, is charged with three counts of resisting an executive officer and one count of assault with force likely to produce great bodily injury. In his opening statement, Deputy District Attorney Michael Reilly said Jefferson “wanted to play by his own rules” when Officer Matthew Ruggiero and Officer Justin Tennebaum tried to get him to walk on the sidewalk on Logan Avenue the morning of Feb. 3, close to where two rival groups were rallying in the park. Ruggiero was hit in the face and suffered serious facial fractures, the prosecutor said. Defense attorney Jimmy Rodriguez told the jury that Jefferson was walking in the street so as not to disturb people gathered at a church near the rally. The attorney asked the jury to determine whether the police were doing their job and whether officers used excessive force against his client. Rodriguez said Jefferson showed courage by defending himself and taking the case to trial. Jefferson faces nine years and four months in prison if convicted.